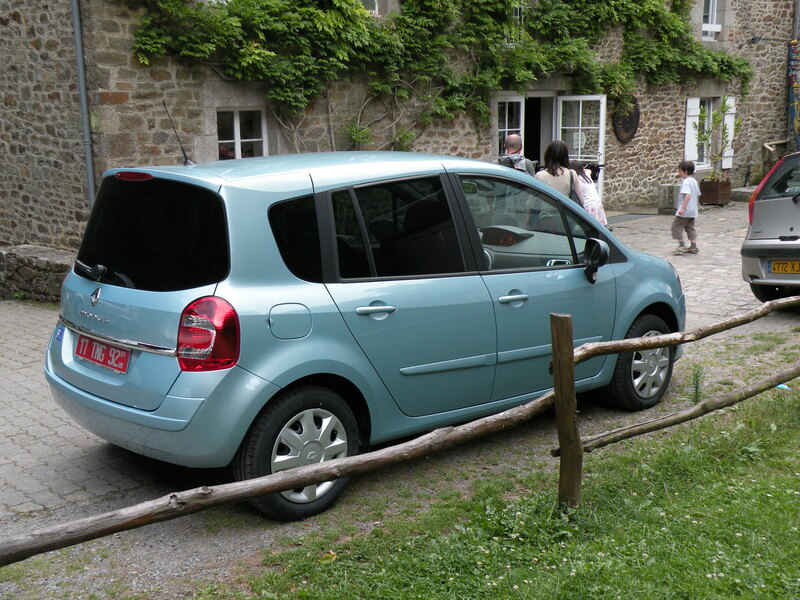 Got up early again and tackled the metro to go to the other side of Paris to pick up my car from Renault Eurodrive. Just when I thought I had it down, I wound up at the wrong place. Apparently there are two St. Cloud areas. I asked a taxi driver to take me to the address 2 Avenue whatever. When he dropped me off, I was at 2 Place whatever. These guys are so picky. I called the car place and I wasn’t too far, so I walked the rest of the way. Still, I made my 9:00 appointment. They ran me through all the paperwork, showed me the car, reviewed all the gadgets and they gave me directions out of town and I was off. Paris was OK… it’s just too big and there’s too much going on for my tastes. It’s hard for me to function in a town like that. Don’t get me wrong, I’m glad I did it. It’s just that when I got on the road, everything started to feel right and comfortable. And oh my gosh, the air conditioning, what a creation that. 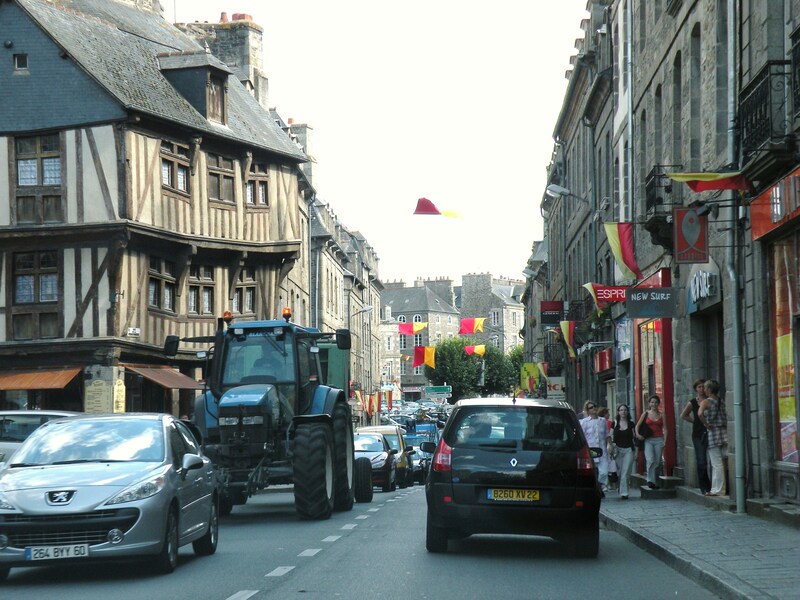 I headed for Dinan, in the Brittany region of France, almost to the west coast. It was a nice, relaxing and scenic country drive. 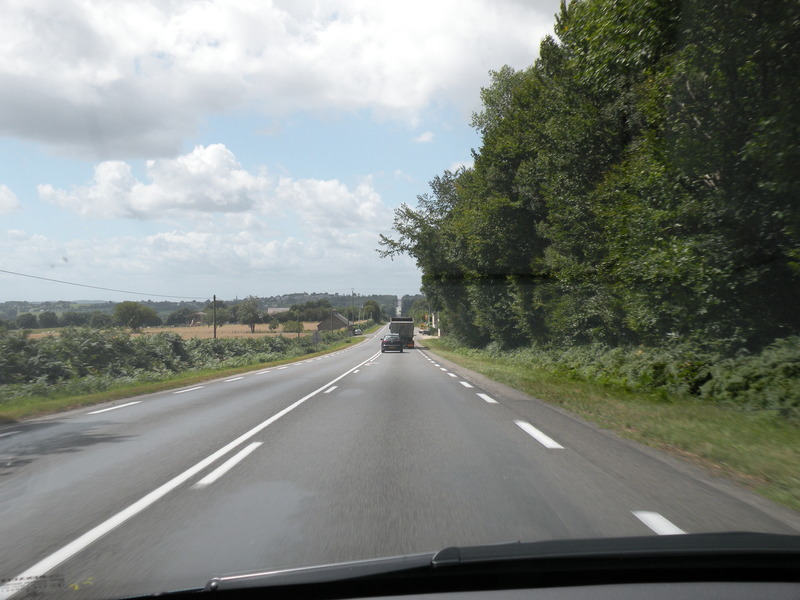 It was just like I was driving country roads in Virginia or Ohio, except for I couldn’t read any of the road signs, and all the really French looking towns and villages I drove through, and everyone talked funny, and all the cars were really small, even the trucks are small. But other than that, yeah, Virginia or Ohio. I avoided the major highways opting for the small slow roads so I could see things. Lot’s of farming; mostly corn, hay and Le Moo cows. It felt good. A little slower pace and my feet thanked me. Just give me a car and a road in front of me and I’m all good. The weather turned cloudy and a little rainy but that was welcome as well as I was getting pretty sun burned. 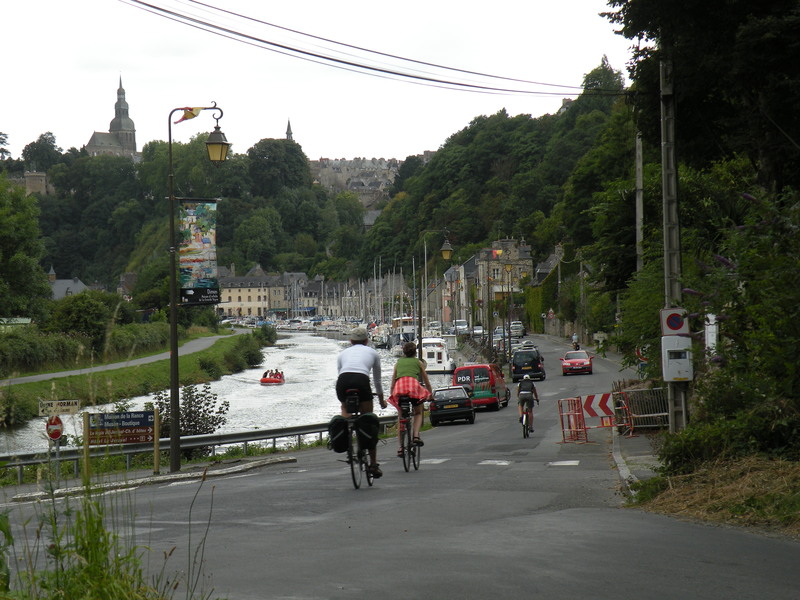 Mid afternoon, I arrived at Dinan. I sure wish I had planned for more time here. 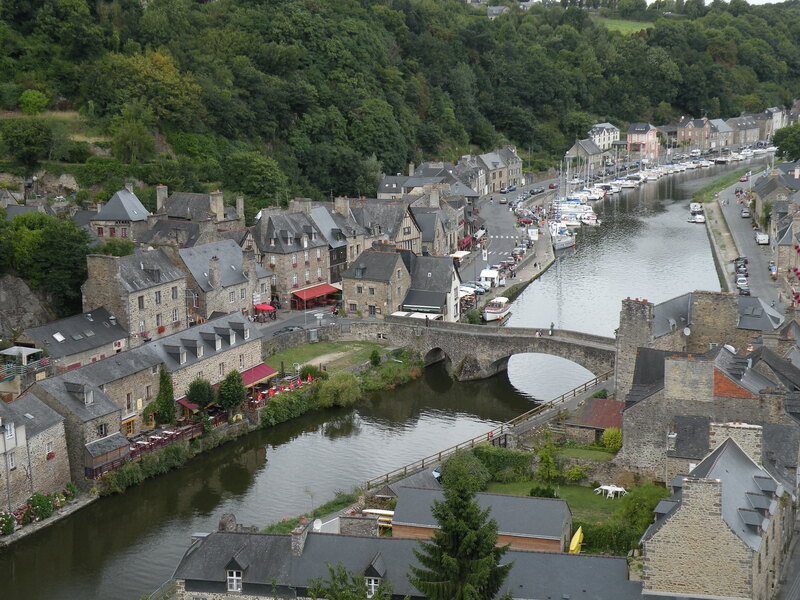 Dinan is a well preserved medieval town and port. As I came around a bend to the bridge over a very deep ravine and small river I let out a big OHHHHhhh, like Tony Soprano and the boys. Off to my right I was looking down on the port and ahead and up and to the left on top of the hill was the walled town of Dinan, with its cathedral and castle fortress. 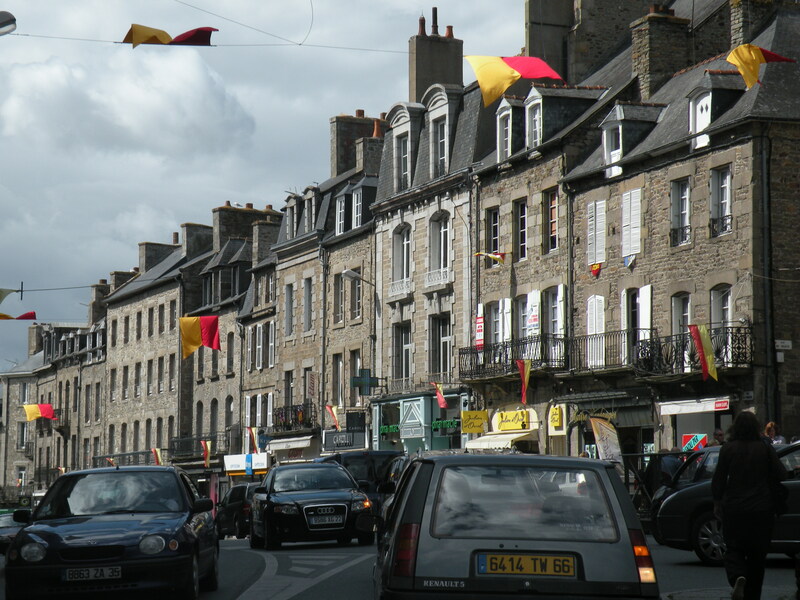 I took a drive to the town and explored a little bit, but it was full of tourists and I realized the town was filled with mostly shops and restaurants. But it is a beautiful village. 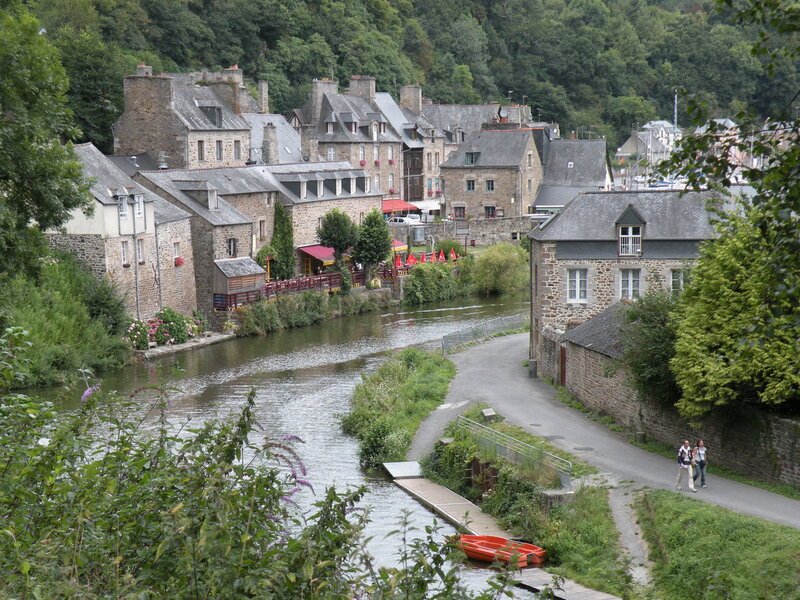 I then headed down the hill to Port Dinan along the river. I felt right at home here. Most places with water, be it a lake, ocean or river, and boats with clanging halyards and seagulls, that’s my kind of place. Then I went looking for my hostel. 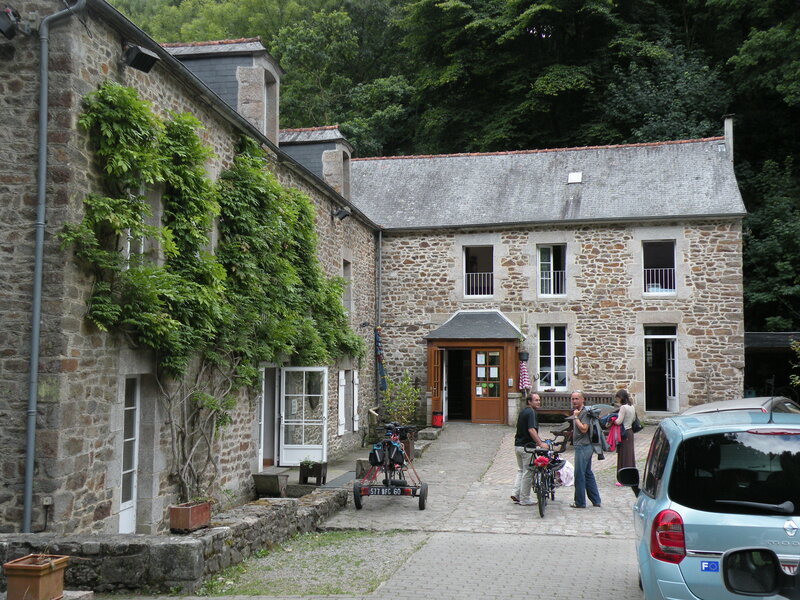 I went along the river for a bit and took a left and was on one of those one lane roads… you know, a lane, it was in very dense woods and all of a sudden, there it was, the Hostel Moulin de Méen. 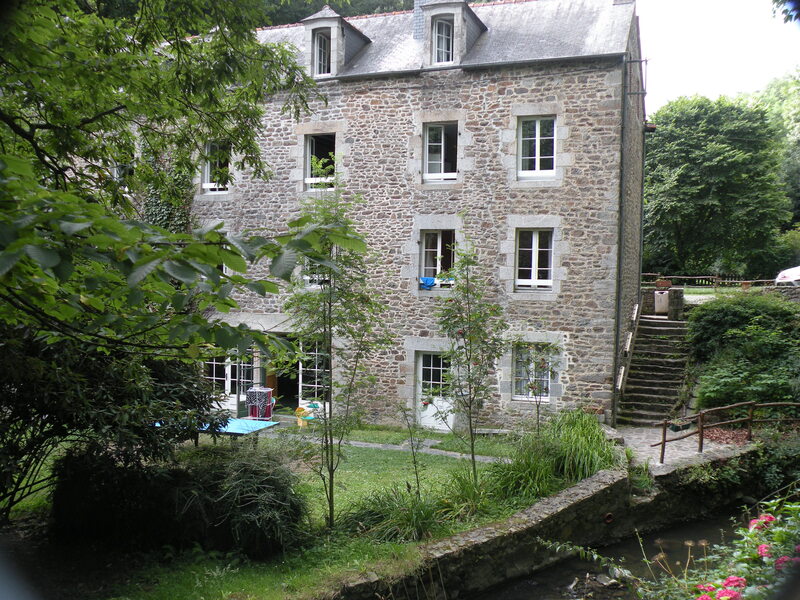 An old stone home that ranked about 9 out of 10 on the charm and coziness scale. I settled in and went for a walk on the grounds. 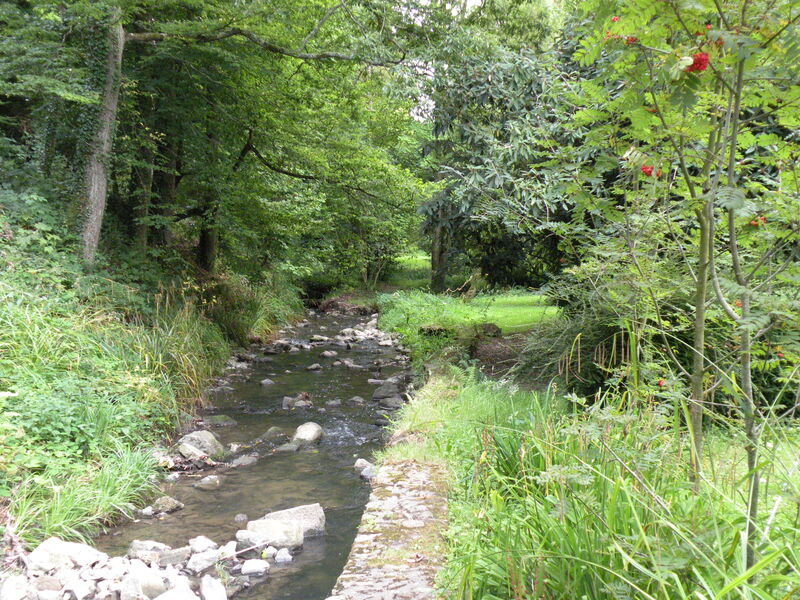 I kid you not, it had a babbling brook right outside my window and that brook babbled all night long. And the air was nice and cool with the breeze coming in the window. I must like this better than the big city because I don’t remember getting up once during the night. My roommates were a couple of girls from Sicily; real fashion-istas, designer boots and all. I thought it odd that they would be staying at a hostel. They spoke and understood a little English and between their phrase book and mine and sometimes using French to bridge a gap, we had a conversation. It wasn’t real deep, but it was nice none the less. They were really sweet girls. I liked that when we got hung up on the language, they didn’t give up like so many others, sometimes me included. I thought that was neat. 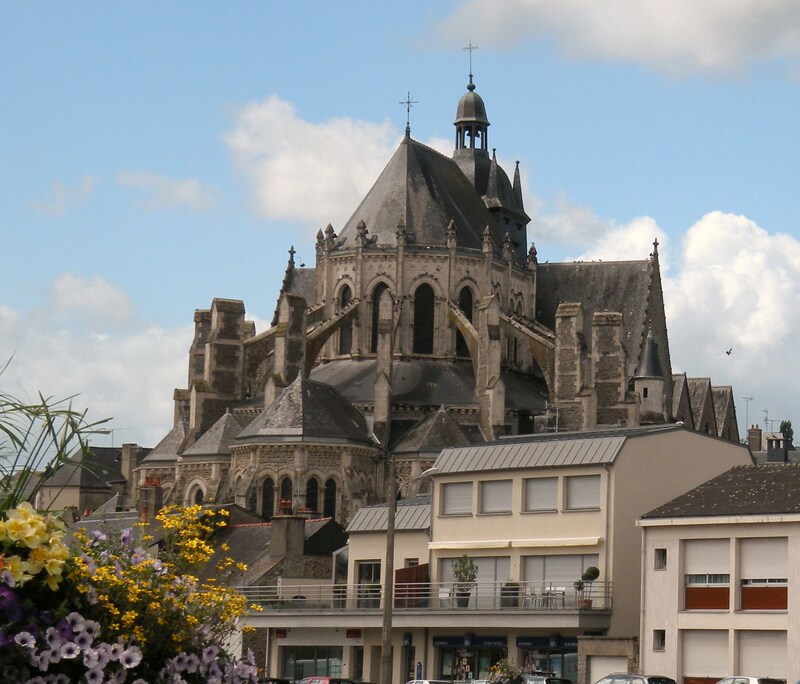 Tomorrow, I’m headed to see Mont Saint Michel and then off to Cherbourg. Hi Maggie, I totally agree with Andrea. Enjoying living vicariously through your adventures and thank you so much for taking the time to share with us all. I appreciate all the photos and your wonderful sense of humor and honesty in your writings. I’m with you. Paris may have it’s charms and points of interest, but this is beautiful and looks much more relaxing! I have to say… I’m really, really enjoying living vicariously through your adventures. It’s neat to see it through your eyes and to hear about all those little things you wouldn’t normally. Like the local opinions on America/Americans and having to pay attention to what’s going on around you to be able to get around. Thank you so much for taking the time to share this with everyone!